We’re back from our summer break and ready to continue the mission to get more women involved in tech. We have quite a lot in store for you, so we highly recommend you opened your calendar right this moment and started booking all the necessary dates. In August, September and partly October we’re concentrating all our powers on getting as many women as possible to take part in Garage48 Pärnu. Even if you know what Pärnu is, Garage48 might leave you puzzled. Let us explain. Garage48 Pärnu is a weekend hackathon that takes place on October 11-13. The participants have 48 hours to pitch their ideas, form teams and build prototypes (or sometimes even a full working product). 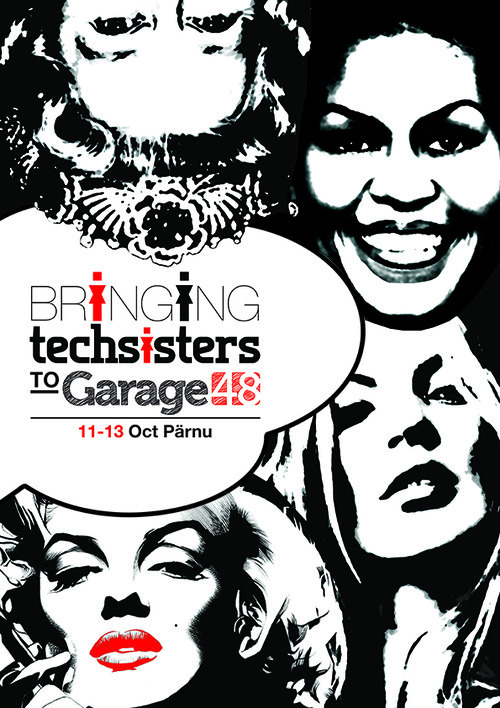 This time Garage48 has partnered with us, Tech Sisters, so we could encourage more women to take part in the event. Now. You’re probably already curious and imagining a weekend in Pärnu, but you still might not be sure whether you’re the right kind of person for taking part in it. Fear no more, because we’re already quite sure you have exactly what it takes! In order to convince you, we’re going to organize a couple of pre-events, where you’ll get a better idea about the whole concept of Garage48 and your possible role in it. We’ve invited women who have taken part in previous Garage48 events, so they could talk about their experiences, share their thoughts and answer your questions. We also plan to share a couple of interviews with former participants on our blog during the weeks leading to the hackathon. Our first pre-event will be held at 6 PM on September 17th at Garage48 Hub in Tallinn, Rävala pst 7 and the second pre-event will take place at 6 PM on October 1st, also at Garage48 Hub. Speakers will be announced shortly, meanwhile keep an eye on our Facebook page and Twitter. Registration to Garage48 Pärnu is already open. If you’re a woman, use the promotion codeXXatGarage48 to register at a discount price 15 euros. Garage48 Pärnu 2013 event activities are supported by Development Centre of Pärnu County, Pärnu City Council, Microsoft Corporation, Credit24, Manpower. Garage48 Pärnu 2013 event belongs to EV95 program and is partly funded through EAS by European Social Fund.